Each year, Intuitive Accountant embarks on an exhaustive search to identify the industry’s leading QuickBooks ProAdvisors. Intuitive Accountant congratulates everyone who made this year’s list! 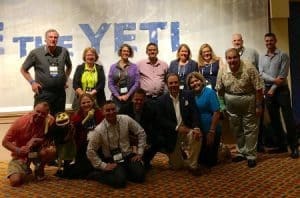 The long wait is over – Intuitive Accountant announced the Top 100 QuickBooks ProAdvisors for 2017 during one of the Main Stage Events at the Scaling New Heights conference in Orlando, Fla. In a room packed full of some of our industry’s leading accounting professionals, Insightful Accountant took center stage to announce its Categorical Winners. Winged Disc Technologies is pleased to announce that Haiden Turner has been named a 2017 Top 100 QUICKBOOKS PROADVISOR by Insightful Accountant. Insightful Accountant is an independent news and information source written specifically for the small business advisor who needs to stay current on the latest news and offerings in accounting technology; including updates from Intuit, Xero, Sage and the hundreds of Add On products serving the small business. The 2017 Top 100 QUICKBOOKS PROADVISOR list recognizes the leading consultants who have embraced the QuickBooks ProAdvisor program and have leveraged it in order to better serve their clients and grow their own business. Haiden became a QuickBooks ProAdvisor in 1997 when Intuit, the maker of QuickBooks, started their ProAdvisor program. Haiden Turner is the Managing Director of Winged Disc Technologies. Mr. Turner has an extensive background in taxes and QuickBooks. Haiden uses his extensive knowledge to assist clients as an Advanced Certified QuickBooks ProAdvisor. I help QuickBooks users solve complicated issues they face in loading and modifying data, QuickBooks custom reporting, custom interfaces, business process automation involving several software packages, and more. I know that almost every organization has unique challenges and special needs. I carefully listen to you to understand what you need – and then I apply the many years of experience I have in accounting, business, information technology, and QuickBooks to get you the solution, or solutions – that are the best and represent the best value to you. I help you get the most out your QuickBooks system by getting it set-up correctly from the beginning; or later, if wasn’t done right in the beginning. I use the functionality of QuickBooks to the greatest degree – taking advantage of QuickBooks Add-ons and integrated applications that extend the capabilities of QuickBooks. At Winged Disc Technologies, we analyze and report on your data to gain greater insight into your operations. We can automate manual processes to reduce entry time, eliminate double entry and reduce the possibility of errors. Winged Disc Technologies, based in Dallas TX, provides QuickBooks Integrations, QuickBooks Consulting, QuickBooks Custom Programming, business process management services and consulting and Total IT Solution to clients in the Dallas-Fort Worth area and nationwide.